Lt. 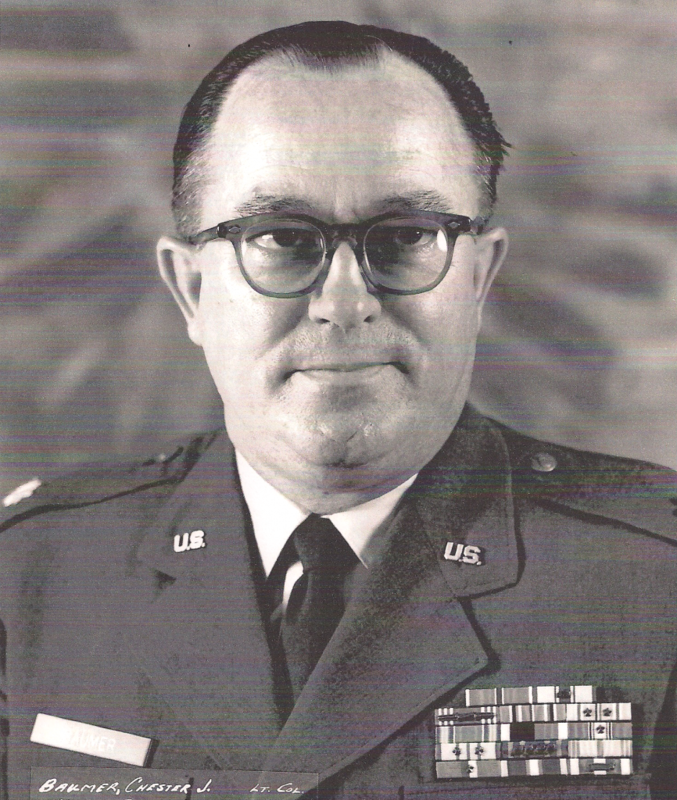 Colonel Chester J. Baumer, United States Air Force, retired, was born in 1923 in Missouri, the son of Gladys and Chester E. Baumer. The following auto-biography was written by him. My Military experience began shortly after my high school graduation in Jun 1942 when I joined the Enlisted Reserve Corps and was sent to the University of North Dakota to learn to communicate via Morse Code. After qualification at the minimum lever, I was trained as a radio repairman FM. After that completion, I was sent back home in Jennings, Missouri to wait for induction into active duty. In September 1943 I was inducted at Jefferson Barracks, Missouri, into the Army signal Corps as a private and received top grades in the qualifying 3 tests (9-125), however, I was classified as Limited Service due to poor vision and told that I would not go overseas. I completed Basic Training at Camp Crowder, Missouri, and was assigned to a small company there. A few months later the government cancelled the Limited Service, and our unit was sent by rail to California. We were put on a ship and travelled in the Pacific Ocean for 58 days and were attacked by Japanese Zero aircraft while we were in Leyte Harbor, Philippines. We finally landed in Manila where the enemy deceased were being removed from the waterfront. We were trucked to the Lingayen Gulf area on Luzon, Philippines where our small company established a signal depot. I worked as a ship liaison to examine ship papers to advise our depot when and where to locate our sole crane. We operated our depot until the Japanese signed the peace treaty. We then travelled to Japan via small personnel craft. Unfortunately, we encountered a typhoon and were tossed about quite a bit. When we arrived in Tokyo, we established another signal depot halfway between Yokohama and Tokyo. In 1946 I was sent back to my home in Missouri and discharged as a Technical Sergeant. In 1947 I joined the Air National Guard as a Tech Sergeant in a signal company. There I was promoted to Master Sergeant and became the First Sergeant of that company. In 1950 I transferred to the Medical Company as their First Sergeant, and was mobilized into active duty in early 1950. My Guard unit was sent to Bergstrom Air Force Base (AFB) in Austin, Texas where I became the Hospital Sergeant Major. Since I had no medical knowledge, I spent my evenings riding ambulances and learned a lot, even helping to deliver a baby on one occasion. A few months later, our Wing was transferred to George AFB, Victorville, California, to transition from prop fighters to jets. At George I became the Hospital Sergeant Major there. At this time, I took the exam for Warrant Officer, AFSC 90.000 and received an appointment as a reserve W-1. Unfortunately, the Air Force would not call me to active duty in that grade. While assigned here, I accompanied the Hospital Commander, a medical Lt. Colonel, to Frenchman’s Flat, Nevada, where we were observers to a nuclear detonation. In 1954, after completing 60 semester hours of college credit in night schools, I applied for, and received, a commission as a 2nd Lieutenant in the Medical Service Corps (MSC). Upon receiving a waiver from Officer Candidate School, I was called to active duty as a 30 year old MSC officer on 20 Apr 1954. I was assigned to March AFB, Strategic Air Command (SAC), Riverside County, California, and replaced a Captain as Squadron Commander. After a year at March AFB, I transferred to Clark AFB, in Luzon, Philippines. There I served first as the Hospital Registrar, and later as the assistant to the medical officer who was the Chief of Professional Services and conducted an internship for graduates of the officer program at the University of Santo Tomas in Manila. After two years in that assignment, I was transferred to the hospital in Ardmore AFB, Oklahoma. Ardmore closed about two years later when the C-130 Wing was deactivated. I then transferred to Luke AFB, Arizona, in 1959 and spent 4 years in positions as Hospital Administrator, Business Officer, and Registrar. During my assignment here, I completed my Bachelor’s degree after almost 20 years of night school with the final 6 months in residence at the University of Omaha in Nebraska in 1962. In June 1962, I transferred to Gunter AFB in Alabama and became an instructor in Hospital Administration for new Medical Officers, Nurses, MSC Officers, and medical senior enlisted in various specialties. While assigned there, I attended a course in New Orleans and became a Master Instructor. In 1965 I was transferred to Sheppard AFB in Texas as one of an advance party to prepare for the transfer of the school, staying there until September 1967 when I volunteered to go to Vietnam. About 6 months prior my Vietnam deployment, I received approval to attend a seminar to learn how to develop a needed course in Executive Hospital Housekeeper for the Air Force Medical Service. When I returned to Sheppard, I designed a two week course, wrote the necessary lesson plans and personally conducted the first class of senior NCO’s just prior to my transfer. In September 1967, I was assigned as a Medical Service Officer in medical material in the Surgeons Office at 7th Air Force Headquarters, 7th AF Air Base, Saigon, Vietnam. I spent one year there and then went to Williams AFB, Arizona, as the Hospital Administrator. There I coordinated the construction of a new 50 bed hospital. While assigned to Williams, I was selected and promoted to Lt. Colonel. My boss, a fellow Major and a physician, was passed over. I was also selected to attend Air Force Institute of Technology (AFIT) training toward a Master’s Degree in Hospital Administration. While waiting for notification of the AFIT School, I had an unfortunate disagreement with the Wing Commander over my interpretation of the regulations relating to assignment of an OB/GYN officer at the base while I gave an address to new pilot’s wives at the Commander’s wives meeting. Since I already had almost 29 years for retirement and several more years to go before being in the zone for Colonel, I decided to retire on September 1, 1972. Chet and his wife, Betty, reside in Phoenix. 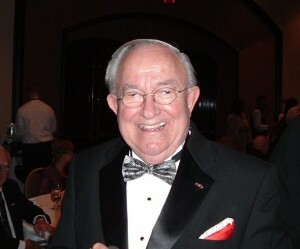 He served as our 42nd Chapter President in 1995-1997.